Using the Medicare Drug Plan Finder can be challenging. You can do it yourself, ask an agent, ask the Medicare drug plan carrier or call 1-800-MEDICARE (1-800-633-4227). The entire process is more frightening than filling out your taxes but with a little practice you will figure it out. By the time you do it again during the next open enrollment you will have forgotten everything you learned. So bookmark this page when it is time to renew your plan and you can fly through the process like a pro. We are happy to run reports for our existing Medicare supplement clients. Or you can call Medicare. OK, this may not be as fun as talking with Jake from State Farm but it can still save you money. As challenging as this process was for 2017, it is even more difficult for 2018 plans. Drugs on Medicare may show as not on the formulary. Call the carrier and get a different response. To maximize savings you may need to change pharmacy’s. One client will save almost $4,000 in 2018 by using a different pharmacy! MAJOR discrepancies in results on Medicare.gov and carrier sites. Calling the carrier can be more confusing. Each time you call you get a different answer. For those who like to do it themselves here is a step by step guide to using the Medicare Drug Plan Finder. Click this link to go to the plan finder. You can also click the General Search image below. Enter your zip in the box Search. Click Find Plan. Select how you get your Medicare coverage. Most people will select Original Medicare and I Don’t Get Any Extra Help. Click Continue to Plan Results. Have all your medicine bottles lined up before moving to the next section. Enter the name(s) of each medication, click Find My Drug. Choose the drug name and dosage you take. Also check off how often filled, quantity and whether you get your drugs at retail or mail order. Repeat the process for each drug. Note you can change the dose, add or remove the drug from your list using the buttons. Make a note of your Drug List ID and Password Date. You will refer back to this in the future. Then click My Drug List Is Complete. If you want to compare prices by pharmacy, pick any two. The next page should look like this. If it doesn’t you have done something wrong. Go back. Make sure the results (below) are for the correct year. The image below was taken in October, 2016 so the default is to illustrate the 2017 plans. If you need to view the current year, click that button. You will notice your Drug List ID and Password Date follow you through the process. The plans you want to compare will appear side by side. You should use your browser setting to print this page. If you know how to print and save as a PDF you should do so and save it on your computer where you can find it again. Notice I chose the plan with the lowest drug cost (Envision). The Envision plan has a deductible, so I picked the next lowest cost plan (Silver Script) that does not have a deductible. Some (but not all) plans do not apply the deductible to tier 1 and tier 2 medications when using a preferred pharmacy. Be sure you know the difference. Often, but not always, plans that have a deductible will have lower copay’s than plans that do not have a deductible. The monthly costs include your premium plus the estimated cost of your drugs. If you go into the donut hole that will appear in the monthly printout (above). If you want to see the estimated copay for each of your medications, click the View monthly drug cost details by selected drugs link. Note the drug copay’s are estimated and do not reflect higher costs due to deductibles or increased costs when you are in the donut hole. If you want to really take this drug plan report for a test drive, check out some other neat things you can do. 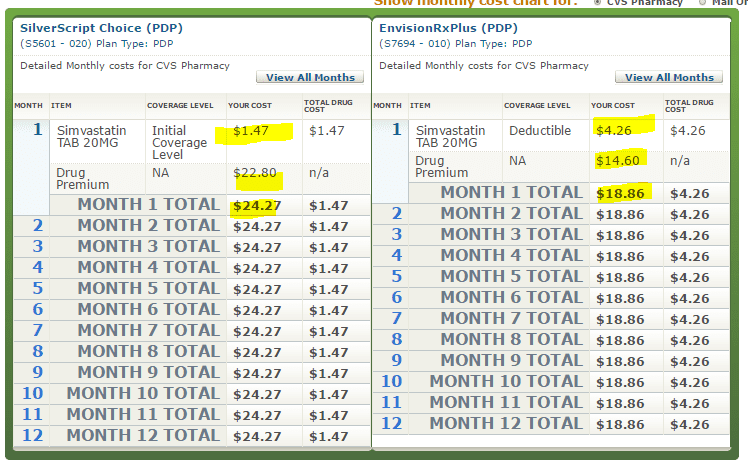 Go back to the browser frame where the monthly drug costs are shown side by side. Scroll down until you see this section (below). Note the tier level for each of your drugs. It won’t always be the same from carrier to carrier. Click Print My Drug List. The Drug List shows all the drugs you have entered by name, dosage, etc. The Comparison Report can be customized to show only information that is relevant to your situation. Sometimes you have to work a bit to find the absolute lowest drug costs. There are times when you want to purchase 30 or 90 day supplies at retail. Maintenance drugs may (or may not) be cheaper by mail. Current clients of Georgia Medicare Plans can stop right now. If you purchased a Medigap plan through us do this. Email me your Drug List ID and Password Date. Give your current zip code and county of residence. I will run your report (based on your Drug List ID and Password Date) then search for ways to cut your drug costs using mail order and discount cards. Not a current client? Shameless plug here. Let us help you find the best Medigap plan that fits your needs and budget. For next year plans I will only do this from October 1 through November 7. After that date I may not have time to perform this service, so no guarantees. If you are not a current client, proceed as follows. Your Medicare Drug Plan Finder will show you which plans save money when you order by mail. Consider ordering drugs from Canada. We have personally used and recommended Blue Sky for years. You can also save money by using a drug discount coupon from GoodRx. You have the option of going online and printing out a coupon, downloading an app for your smartphone, or requesting an ID card you can carry in your wallet. If you use insulin, most Canadian pharmacy’s will not ship it to you. Insulin prices in the US, even with a Medicare drug plan or discount card are crazy expensive. We have found one Canadian pharmacy that stocks and ships insulin direct to you. Check insulin pricing before enrolling in a Medicare Part D plan. Now you are ready to sign up for a drug plan. Before you enroll in a plan, call the carrier you think you want to use. Now that you have the copay for each drug from the carrier you think you want to use, go back to your piece of paper with the drug prices. Now that you have all your information it is time to enroll in a drug plan. I have been advising clients to enroll via 1-800-MEDICARE for years and have had no complaints. When you follow my step by step instructions you can be enrolled in a drug plan in less than 15 minutes. No hassle. No sales pitches. It will probably take you longer to read this post than it will to use the plan finder. With over 400 clients spread all over the state of Georgia, I don’t have the time to help everyone the way I would like to. By asking you, my client, to do the front end work I can still help others find a Medigap plan that fits their needs and budget without totally abandoning my existing clients. If you take fewer than 5 medications it will take you about 15 minutes to get results. More than 5 will take a bit longer. If you find this helpful, share this link with your friends. Thanks, and have a great day!